Last year, Sam Mullet received 15 years for his role in beard and hair cutting attacks on Amish in eastern Ohio. But 15 others got lesser terms, ranging from a year and a day to seven years. “I read, played softball and played pool. I liked pool and I was pretty good at it,” Raymond said. Kathryn, 25, who also learned the game, shook her head ‘no’ in the background. Raymond lost weight in prison because he did not like the food but says he did develop a liking for Mountain Dew. Kathryn tends to a strawberry patch and the three young children she had to leave in the care of her mother while she was in prison. Her now nearly 3-year-old daughter sometimes calls Kathryn’s mother “mom” even though Kathryn has been home two months. “She still asks for my mom a lot,” she said. Kathryn said she wore a smaller head covering than her typical Amish bonnet while in prison, along with long brown dresses. She uses prison slang and referred to fellow prisoners as “cellies” and “bunkies” and talked about the SHU, or solitary housing unit. “I didn’t feel like I was Amish,” she said. Knowing that she would be returning soon to her family kept Kathryn going. She also discovered yoga and step classes. Miller currently wears an ankle bracelet and has had a phone put in to be able to make daily calls to his probation officer. Some have wondered whether this group would disintegrate and/or disown Mullet following their incarcerations, but that comment seems to suggest otherwise. A less bizarre wrongdoing against the Amish was committed in western New York, just the latest of recent accounts of crime against Amish. And as in those other cases, the perpetrator has been caught. A 22-year-old man robbed an Amish shop owner at gunpoint, then tied him up. The Amishman later gave authorities a description of the vehicle, which led to the robber’s arrest at his home. How much thought do these guys put into their plans? 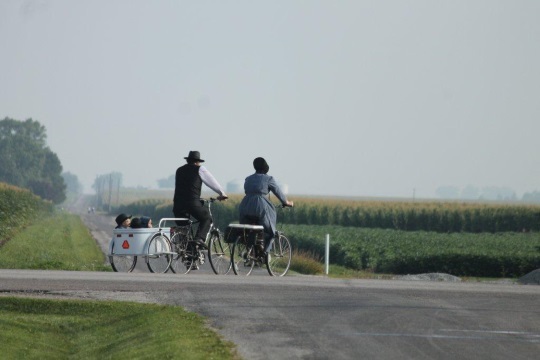 After the potentially good news given in last week’s article on lower Amish asthma rates, the spotlight is now on a less-rosy side of Amish health. In the general population, FH traditionally was believed to be found in 1 in 500 people, but recent studies have suggested it is more common, perhaps found in 1 in 250 people, Rader said. In the Amish and Pennsylvania Dutch, the rate could be even higher, Rader said. Doctors already know that Amish people have a much higher rate of high cholesterol, due to a specific genetic mutation that is known to have originated in German-speaking Switzerland, the original home of the Amish, Rader said. More studies are needed, Rader said, to determine the rate of FH in the Pennsylvania Dutch community, and determine if it is a founder population. In the meantime, doctors do know that if a child’s mother or father has a gene mutation causing FH, each of their children has a 50 percent chance of inheriting it. If left untreated, 50 percent of men by the age of 50 and 30 percent of women by the age of 60 with FH will suffer a heart attack and possibly die, Davis said. People with FH cannot control the disease with diet and exercise alone. “They can be as skinny as a rail, run five miles every day, eat grass and still have high cholesterol,’’ Davis said. The goal is to treat FH afflicted individuals and identify relatives who may be at risk, using a strategy called cascade screening–essentially checking a high-LDL individual’s close relatives, as well as extended family, for similar readings. To do his work Glick has rebuilt and modified electric forges to run on “liquid fuel, compressed air or batteries.” The full article is at philly.com. While I had hoped these folks might have had time to reflect on what they did while away, and see the error of their ways, the comment about a pool table at Sam’s indicates to me that they are still pretty much in his camp. That’s probably not a good thing…. Pool table at Sam Mullet's? That comment just jumped right out at me, almost as if they expect Sam to be there soon too? The Millers said they do not regret going to trial but do not believe it was fair and are appealing their convictions. Not that I am in any way familiar with the case at hand, but something that stands out to me as not so good is that she apparently “discovered yoga”. While being in jail might be bad enough, engaging in yoga (which stems from hindu mysticism) and thus tempting God is not something I would wan’t to do, especially not as a christian. If someone knows her, please tell her to stop and think about what she’s doing. (Ironically, one of the purposes of yoga is to stop ones mind from thinking completely, while practicing it). made me want to get in my car right now and drive on over. Glad you liked it Al. Sadly I have gotten so used to seeing these crime against Amish stories, feels like a weekly thing. We’ll have a nice set of SI’s Arthur photos later this week. Interesting, regarding the Bergholz group. I don’t think putting someone in prison can change their deeply held beliefs, if anything, people may hold onto their beliefs even stronger in such circumstances. I do hope for the best for these individuals as they rebuild their lives. Perhaps the more “worldly” ways they are encountering now will do them good. There is a lot of life beyond Sam Mullet and his group. That’s a good point Ed as I can easily see it breeding resentment or sense of martyrdom especially if you don’t think you were treated justly. It’s hard to read much between the lines from just this one article-they sound upbeat but obviously don’t think they got a fair trial. The Bergholz stuff is interesting, no doubt. However, the blurb on the genetic link or FH cholesterol is personally VERY interesting to me. I have high LDL cholesterol; I take medication to try to lower it, but it is a struggle. All, as in 100%, of my mothers family originated in the German speaking region of Switzerland. My paternal grandmothers family did as well. My father had his first heart attack at age 49, his second and fatal heart attack at age 59. Ironically, he was trim and fit looking. You would have never suspected that he had high cholesterol by just looking at him. I had never heard of this FH connection, so I will be reading up on this for sure. Thank you Amish America for pointing this link out to me! I’ll be really happy if this knowledge leads to any benefit for you Oldkat. Maybe identifying if you have the FH condition will point the way to another way of treating it.